Virtual Water is the total volume of water needed to produce and process a commodity or service. The measurement is typically used by water-scarce countries to evaluate the most efficient and economical use for their water supply, but it could also apply to the water polluted through industrial processes. After WWI the Gowanus Canal in Brooklyn, NY was the busiest and most polluted waterway in the country. Airborne and water pollutants from coal yards, mills, manufactured gas plants, tanneries, chemical plants, paint, ink, and soap factories, as well as raw waste from sewer systems flowed into the canal for decades. Initial plans for the canal included measures to adequately flush the water but were considered too expensive. It was built with serious design flaws but within budget. The canal continues to be among the country's most polluted bodies of water. In my eyes it exists as a case study of mankind's unrelenting effort to manipulate a world where progress justifies the means. 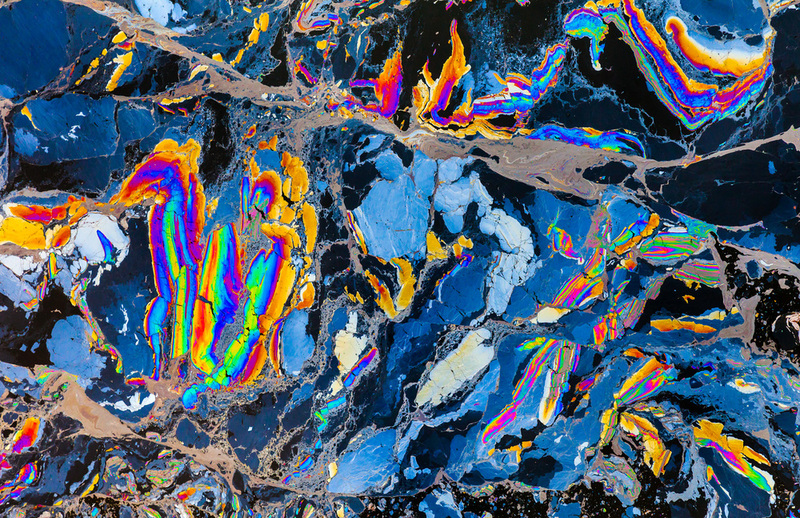 This photographic series is an investigation of the Gowanus Canal as a body of virtual water, which through industrial processes has rendered this natural resource toxic to its environment. The condition of progress generates incremental conveniences, but the cost is an immense amount of waste. Yet like a flower wilting and dying, this cathartic destruction comes with it's own beauty. Everyday the toxic slicks dance with the tide on top of the waste water up and and down the canal in psychedelic gradients and patterns. There lies a confusing moment in which the viewer must navigate between the seduction of the canal’s overt beauty and the latent repulsion of it’s historical circumstances. The visual impact of harmonious colors and compositions serve as a catalyst to foster a deeper engagement between the viewer and these underlying truths. By indicating these dichotomies, I aim to provide an opportunity for a meaningful discourse of our often convoluted modern social landscapes.